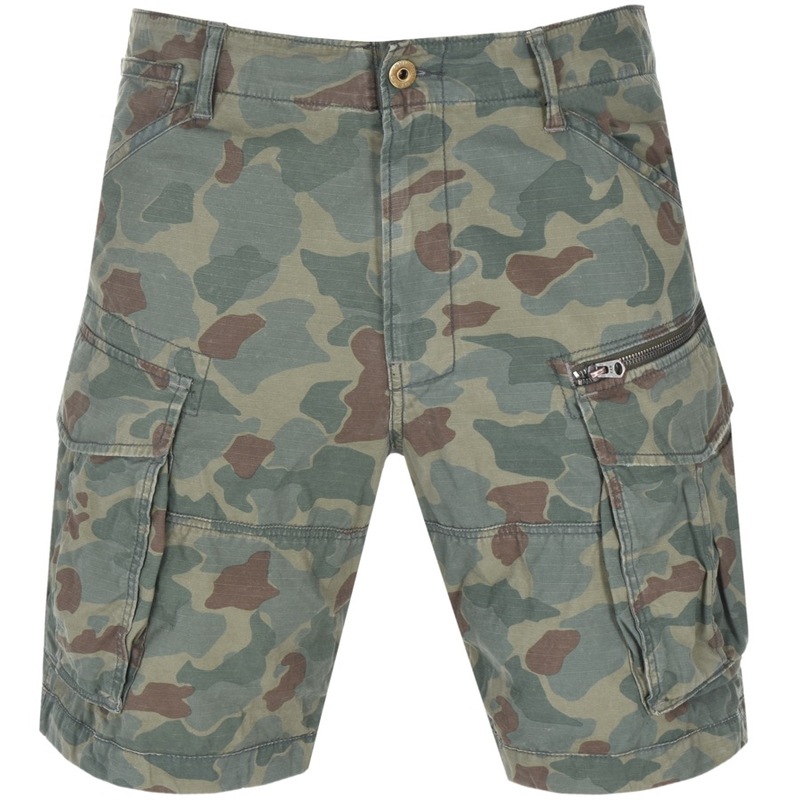 G Star Raw Rovic Relaxed Combat Shorts In A Sage Green, An all over camoflage design on the front and reverse in green, khaki and brown. A zip fly with a G Star Raw branded top button fastening and five belt loops on the waistband. Two hip pockets with a small coin pocket within the right pocket and two large flap pockets on the reverse with press stud fastening. Two large slanted cargo style flap pockets on the sides of the thighs also with press stud fastening and one large zip pocket is above the left cargo pocket. The signature woven G Star Originals logo patch is situated by the left hip pocket in sage green with a brass coated metal G Star Raw logo stud situated on the right cargo pocket flap. Adjustable white drawstrings at the leg hem and top stitching on the seams in green. Shell: 100% Cotton, Pocket Lining: 50% Polyester and 50% Cotton. Part Of The Fantastic G Star Raw Collection Of Jeans Live Online.